On this website you find the publications of Prof. Dr. Reinhold von Sengbusch. 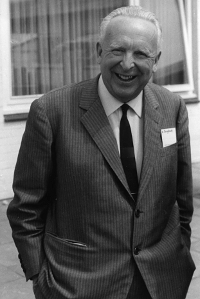 Reinhold Oskar Kurt von Sengbusch (* 16 February 1898 in Riga; † 13 June 1985 in Hamburg) was a Director at the Max Planck Institut für Kulturpflanzenzüchtung in Hamburg-Volksdorf and one of the most important breeding researchers of the last century. In addition to many of his publications you can find out more about his favorite topic, his breeding achievements and the scientific impact he had. Reinhold von Sengbusch began to publish in 1924 and continued until the nineteen-eighties. Sengbusch alone and together with his colleagues published about 300 scientific articles. His institute produced about 600 publications. Over time the fulltext availability on this site will increase. This collection is presented by the Max Planck Digital Library. The photographs of Reinhold von Sengbusch and the Institute are provided by the Archive of the Max Planck Society. As we would like to increase the usability of this website, please feel free to send us your comments.